The kidneys are bean-shaped retroperitoneal structures. They are situated in the posterior abdominal region on each side of the vertebral column. The right kidney is positioned lower than its left counterpart due to its relationship with the liver. Although both kidneys are similar in size, the left kidney is a little longer and more slender than the right. The kidneys’ main function is to excrete end-products of metabolism and excess water in the form of urine. Urine is then transported by the ureters to the urinary bladder. This is essential for the maintenance of electrolyte and water balance in the body. Moreover, the kidneys have notable endocrine functions as well. 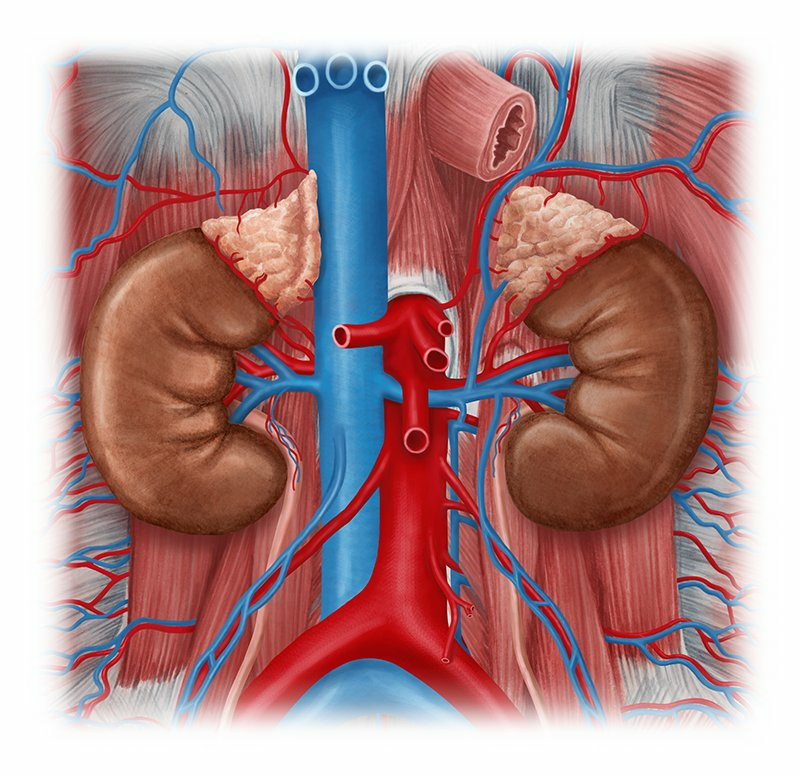 The two kidneys have numerous relations with the other nearby structures. On the anterior surface of the right kidney, the right suprarenal gland covers a small area of the superior pole, while the liver covers the large area immediately below it. A narrow area is covered medially by the descending part of the duodenum. The right colic flexure is directly in contact with the lateral side of its inferior pole, and the small intestine with the medial side. The anterior surface of the left kidney also has many relations. The left suprarenal gland covers the medial side of its superior pole, while the stomach and spleen cover the rest. The pancreas rests against the central part of the kidney, with the stomach lying above it. The left colic flexure and the beginning of the descending colon cover a narrow lateral strip on the lower half of the left kidney, while the jejunum is related to its medial side. Posteriorly, both the right and left kidneys are located inferior to the diaphragm, and superior to the psoas major, quadratus lumborum, and transversus abdominis muscles. The kidneys are surrounded by complex layers of fascia and fat. They are enclosed by the tough fibrous renal capsule and renal fascia, which encompasses the suprarenal glands as well. They are also associated with a collection of perirenal and pararenal fat. In addition to their external coverings, the medial aspect of each kidney is marked by a deep slit termed the renal hilum. The renal hilum serves as a gateway for renal vessels, nerves, and lymphatics to enter and leave the kidney. The kidneys have an intricate inner structure. The renal parenchyma consists of an outer cortex and an inner medulla. The cortex is a continuous band of pale tissues that extends into the medulla as renal columns and divides it into renal pyramids. The base of each pyramid is directed outward towards the renal cortex, while the apex of each projects inward towards the renal sinus. The renal papilla is the apical projection. It’s surrounded by the minor calyx, a structure that collects urine from the pyramids. The minor calyx represents the proximal part of the tube that forms the ureter. Several minor calyces form a major calyx. Two or three major calyces unite together to form the renal pelvis. From there, urine drains into the ureter, which is then transported to accumulate in the bladder. The arterial blood supply of the kidneys is provided by the renal arteries that arise directly from the abdominal aorta to enter the kidneys via the renal hilum. The venous blood flows via the left and right renal veins to directly drain into the inferior vena cava. The kidneys are innervated by the renal plexus surrounding the renal arteries. It contains predominantly postganglionic fibers from the sympathetic nervous system. Want to learn more about the Kidneys?